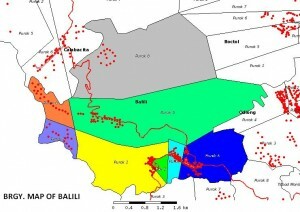 The present and official name of the barrio is Balili. Its popular name is Tanabog. According to the early people who inhabited, this place had a difficulty naming this place. They could not think of a good name at first to the place where they were living. One of the inhabitants suggested that since the place is abundant of morsico, which they call also balili, they just called it Balili. From that time until now the name that derived from the balili plants remained the name of the present barrio. The sitios included in the barrio are: Capao-an and Seling. Barangay Balili shall be agriculturally developed with infrastructure. Provided basic social services for a healthy cooperative and hardworking people and through the initiative of the barangay officilals. The people of Barangay Balili are tightened with a strong unity, love and help of the people, together with the barangay officials, Barangay tanod, government agencies, non government organizations that faithfully and honestly serve the people program about health education, culture, infrastructure, economic without working and searching behind the “bulok of politics”, originally look for the success and improvement of the people.